The final good-bye at the end of the program. Happy New Year! Thank you for your prayers and support for our work in Burma, Kurdistan, Sudan, Syria and Iraq. 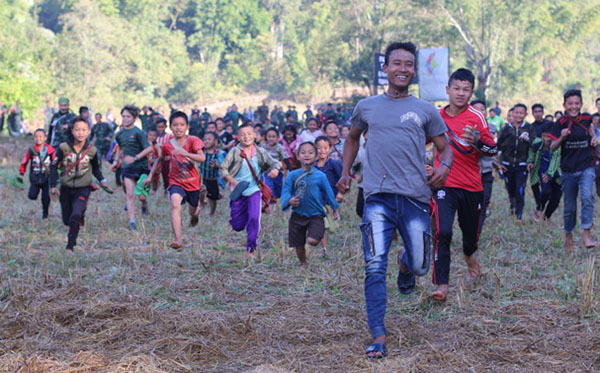 In Burma, more than 200 rangers, 140 of whom are newly-trained, celebrated the beginning of 2019 in northern Karen State at the beginning of their first mission. After traveling by foot from the training camp to the village of Tha Da Der, the rangers got to work putting their freshly-learned skills into action. Teams could be seen setting up their solar panels in the rice paddies and slinging their hammocks in bamboo clusters near the small village, which has been burned three times by the Burma Army, most recently in 2012. 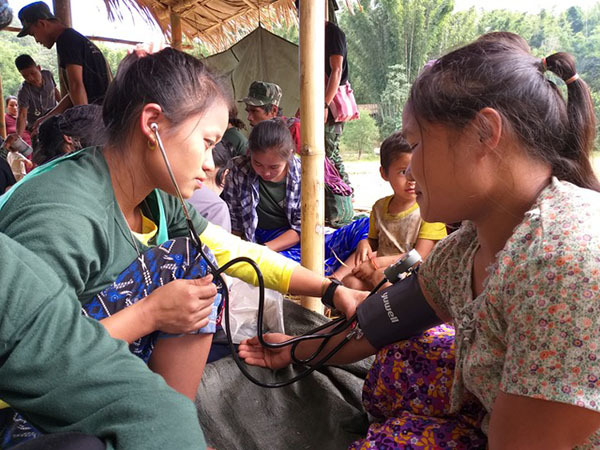 Having just completed the grueling final field exercise last week, the rangers enjoyed their first real-world mission: a reconnaissance of Maw Pu Burma Army camp, a GLC program, and a medical clinic serving the people of Tha Da Der and four other nearby villages. The reconnaissance was first: security personnel from each team moved out from Tha Da Der early Monday morning to spend the day observing Maw Pu Camp, a small Burma Army outpost staffed by approximately 50 soldiers. The rangers navigated to three waypoints using handheld GPS devices, bringing them to observation points 100, 250, and 600 meters away from the camp. There, they used their high-zoom cameras and binoculars to observe the camp, and made sketches diagramming the layout and key features of the outpost. Due to the uncertain nature of the ceasefire in Karen State, the rangers were careful to move quickly and quietly to avoid detection. The rangers spent about three hours rotating between the observation points, then regrouped and debriefed the mission. The purpose of the reconnaissance is to monitor the activity of the Burma Army, report any human rights and ceasefire violations and show the Burma Army is still occupying the land by force. 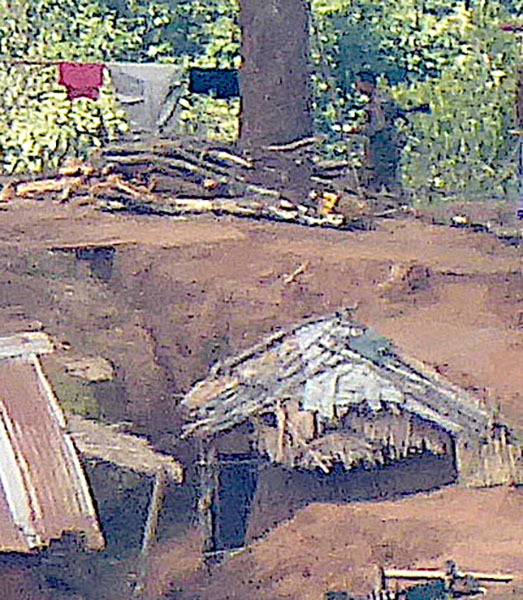 Maw Pu camp from a distance. 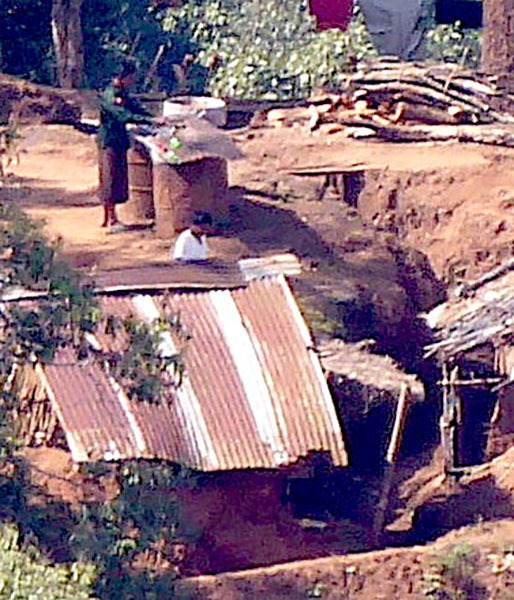 Bunker system in Maw Pu camp. Afterwards, there was a post-mission prayer and debriefing, and the rangers delivered a SALUTE (Size, Activity, Location, Unit, Time, Equipment) report. The group then exfiltrated back to Tha Da Der, albeit with a single ominous occurrence. A remote-controlled drone, believed to be operated by the Burma Army, was spotted by several rangers following the group back to the village, leading FBR leadership to believe that the reconnaissance was detected by the Burma Army soldiers at the outpost. 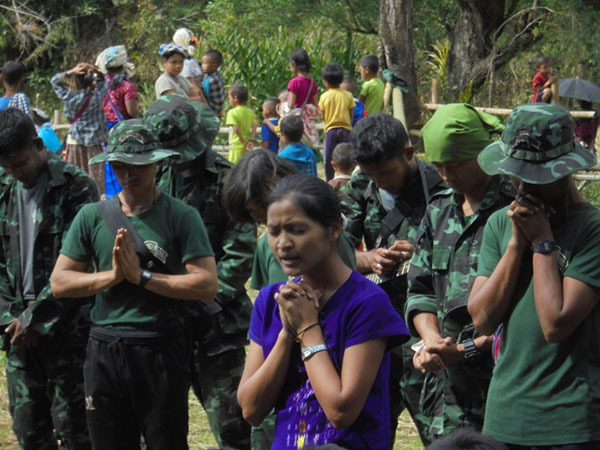 No further activity was noted, but the rangers will be on high alert and in need of prayers for safety as they move from Tha Da Der to go on missions to various parts of Burma. 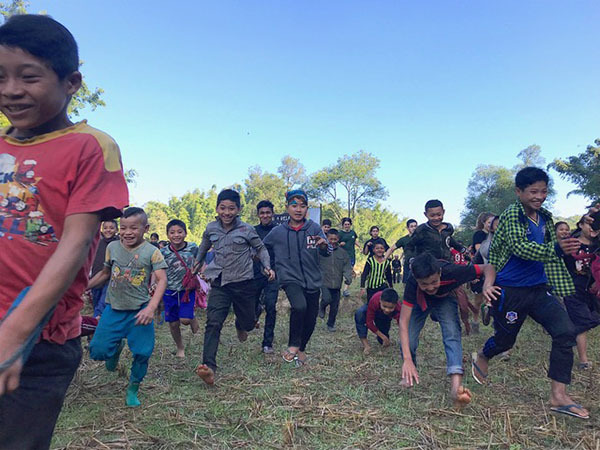 The Good Life Club program started the new year with a bang, beginning with the Run for Relief, a 5km race across muddy rice paddies on January 1. 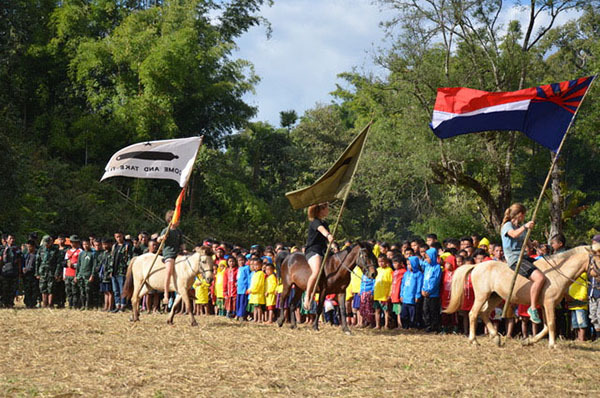 Rangers had their video cameras rolling as young Karen villagers galloped around the course in an assortment of flip flops, skirts, and soccer jerseys. Prizes were awarded to the top finishers, followed by the GLC leaders officially kicking off the festivities for the day. Over 300 kids participated. 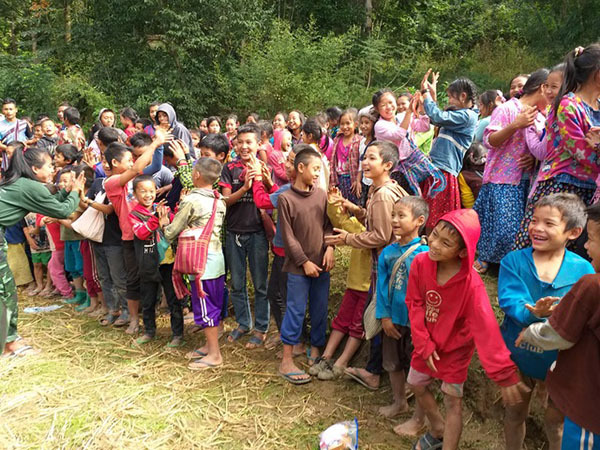 The rangers led the GLCers through singing and dancing, skits, healthcare lessons and games, and handed out shirts, GLC bracelets and other prizes. It was a beautiful, sunny day and fun was had by all. GLC leaders teach the kids new songs. An advanced Ranger leads the younger kids out on their race. A GLC team leader prays before breaking for lunch snacks. Also on Tuesday, ranger medics as well as visiting FBR doctors held a medical clinic for local people afflicted by a variety of ailments. They triaged patients, recorded their symptoms, and administered medical care and medicine. Over 100 patients were seen by the FBR medical personnel. At the end of the day, one FBR guest was baptized in the Yunzalin River, 45 minutes’ walk away from the program site. During graduation at Tah U Wah Training Camp, five others had been baptized. 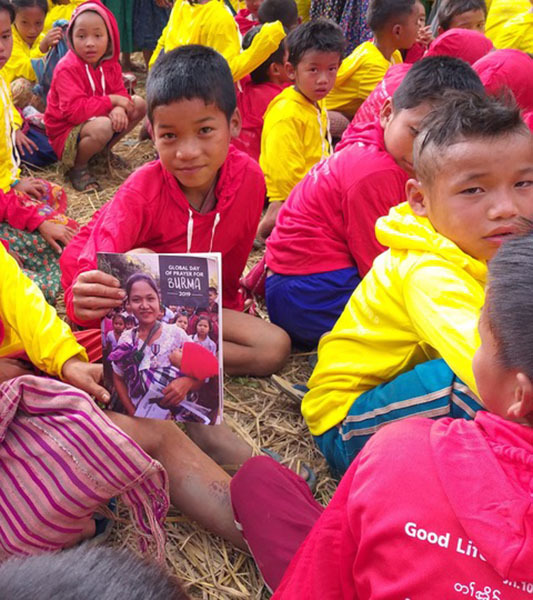 We thank you for your continued support and are praying for all of you, as well as for the continued improvement in the situations in Burma, Syria, Kurdistan, and anywhere else where injustice affects and displaces people. Happy new year and never surrender! A new medic treats a patient at the field clinic during the program. A young boy with a burned foot comes for treatment after the program. Kids in new GLC shirts check out the 2019 Day of Prayer magazine. The start of the Tha Da Der Run for Relief – taking off across wet rice paddies. Riding in with the flags at the end of the program. Burma Army soldier with his weapon.